Lately the only vegetable my daughter wants to eat is cauliflower. I am kind of getting tired of steamed cauliflower so I went to my fail proof way of cooking vegetables and the cauliflower was delicious. My family actually ate an entire head of cauliflower for dinner. 1. Clean and chop your cauliflower. 3. Place the cauliflower in a large bowl and drizzle with just enough olive oil to coat the cauliflower. 5. Toss the cauliflower until evenly coated. 6. 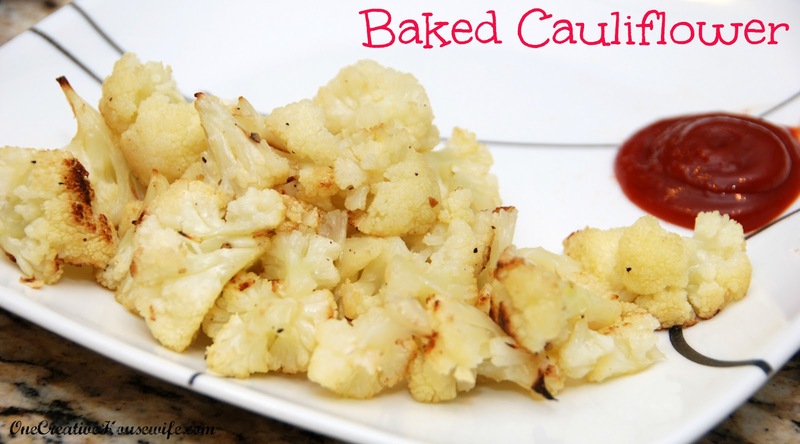 Spread the cauliflower in a single layer on a baking sheet lined with parchment paper, or non-stick foil. 7. Bake the cauliflower for 30-40 minutes, turning part way through. Serve as a side or a snack. My kids like dipping it in ketchup, but I like it just as it is.